I was super surprised to see a big avo before I’d even made it to the Big Avo and looking back it was probably more impressive as well! 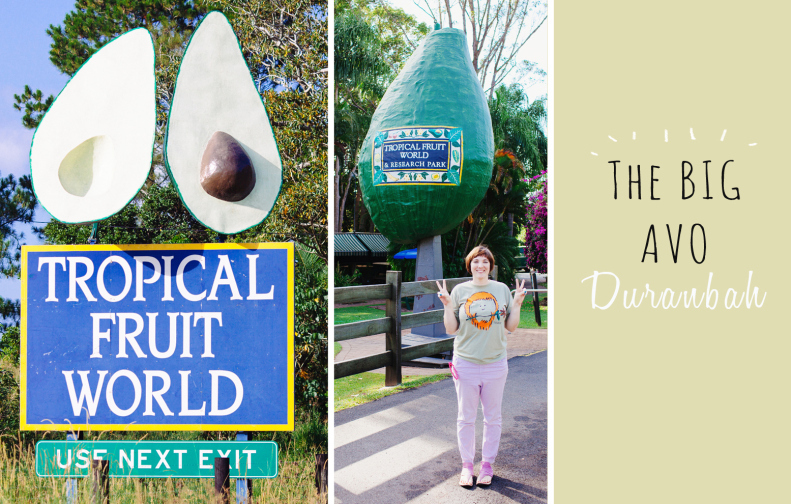 You’ll be able to pull over (not too dangerously) on the side of the Pacific Hwy to get the halved avo pic and then once you turn off for Tropical Fruit World it’s about 5kms of driving up a scenic mountain before arriving at the other big avo. When we arrived, Tropical Fruit World hadn’t yet opened but we still found the big avo located down the front of the carpark – all very accessible :) I thought the avo was okay, it wasn’t really that big and had a dorky advertising sign on it, I personally would of made the advertising look like an avocado sticker – you know subtle commerical-ness :) Just a suggestion.